>Boyle Scores in All-Star Game! > Just a quick note here, as Miami alum Dan Boyle has scored the 4th Western Conference goal in the NHL All-Star game. Assists went to Shane Doan (Phoenix Coyotes) and Brian Campbell (Chicago). This season, Boyle has 13 goals and 25 assists with the San Jose Sharks and leads the NHL in scoring by defenseman, with 38 points. For Dan, the All-Star game is the first of his career. The San Jose Mercury News has a nice article on Boyle’s All-Star selection here. For going undrafted, Boyle has had one heck of a career. >No surprise here, as former Redskin and current San Jose Sharks defenseman Dan Boyle was named today, to the 2009 Western Conference All-Star roster. This is Boyle’s first all-star selection. He is currently tied for the lead among NHL defensemen for both goals (12) and points (32). He also has 20 assists. Congratulations on a well deserved all-star selection, Dan! Boyle actually wears jersey No. 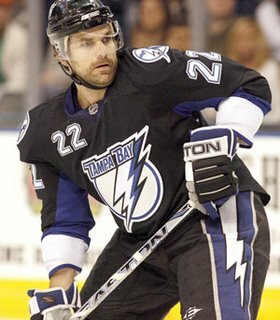 22 in honor of his favorite Flyer — Rick Tocchet, now the Tampa Bay Lightning coach. The Lightning were Boyle’s former team. – Ryan Jones scored yet another goal on Wednesday night, as the Milwaukee Admirals defeated Quad City, 5-3. Jonesy now has 6 goals and 3 assists in 8 games with the Ads. Can a brotha’ get a call up? – After a weekend sweep of lowly Western Michigan, the RedHawks have moved up one spot, to number three, in the latest USCHO.com Division I Poll. Miami trails Notre Dame and Minnesota at 1 and 2, respectively. – Former RedHawk captain Andy Greene participated in the New Jersey Devils optional morning skate today and should be close to returning to the lineup after breaking his right hand on October 29. Greene says that he isn’t sure exactly when he’ll be back in the Devils’ lineup, but says he does expect to practice tomorrow. UPDATE: Devils Coach Brent Sutter said before Wednesday’s game that Andy will not play until at least next week. Source. Package One (Click Here): Fans can bid to be the “Guest Coach” for the RedHawks and join Coach Blasi on the bench as Miami hosts Bowling Green Falcons on January 30. Bidding ends on December 14 at 5:30pm. Package Two (Click Here): Up for grabs here, are four tickets to the Miami/Northern Michigan game on February 20. However, these aren’t just any tickets. The lucky winner of this auction will get to enjoy this CCHA match up from Coach Blasi’s box suite at Cady Arena. This auction also ends at 5:30pm on December 14. Be sure and have the checkbook ready if you plan to bid. Both packages are already quite pricey, but it’s for a great cause. For more information on the United Way of Oxford, check out UWOxford.org. – Ryan Jones scored yet another goal Wednesday night, as the Milwaukee Admirals defeated Quad City, 5-3. Jonesy now has 6 goals and 3 assists in 8 games with the Ads. Can a brotha’ get a call up? – And finally, the RedHawks take on the RPI Engineers this weekend. Once again, it’s a Saturday/Sunday series. Saturday’s game will be broadcast live on ONN with Dave Allen (play-by-play) and Kevin Ackley (color commentary). >Quick update here just before I head off to bed. 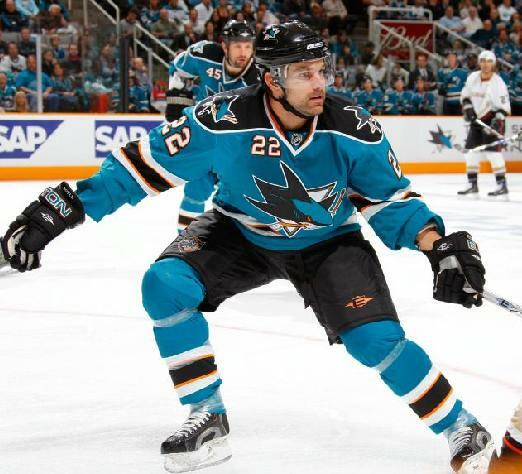 – Dan Boyle chipped in a goal as the San Jose Sharks denied the Philadelphia Flyers their first win of the season. San Jose won, in a shootout, 7-6. – Nice find by laxmom here, as the Newark Star-Ledger has a nice article about Andy Greene and his “perfect record” in the Devil’s lineup. (You’ll have to read the article, if you don’t know what the “prefect record” is.) Greene now has one goal and two assists so far this season. – Ryan Jones has updated his blog with the Nashville Predators. The blog is linked on the upper right side of this page. Jones is also featured in the video below, reading to some elementary school children. What a guy. No surprise here, as we all know Boyle has been a standout defenseman in the NHL for the past several years. >As training camps begin to open for many leagues, here is a running list of former RedHawks who’ll be involved. Obviously, some of the names won’t be a shock, as there are a few “established NHL-ers” here. If you find a name I’ve missed, please contact me. What’s this? Brian Campbell is leaving for big money in Chicago? No problem! GM Doug Wilson brought in somebody even better. Personally, I can’t wait to watch this stud offensive defenseman light up the West in teal and black. A freak wrist injury marred his 2007-08, one season after he scored 20 goals for the first time and had career-highs in assists (43) and points (63). Since 2005-06, Boyle is tied for sixth among all defensemen in goals (39), 18 of those on the power play. To see the rest of the defensemen, ranked 2-75, click click here. 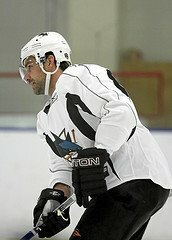 > Former RedHawk defenseman Dan Boyle (Class of ’98) has been acquired by the San Jose Sharks of the National Hockey League. Boyle, who spent 6 years of his professional career on the Tampa Bay blueline, was sent to San Jose, along with Lightning teammate Brad Lukowich in exchange for Matt Carle, Ty Wishart, a first round 2009 draft pick and a fourth round draft pick in the 2010 draft. In his 4 years at Miami, Boyle netted 40 goals and 107 assists for a total of 147 points and was a 1997 & 1998 First Team West All-American selection.